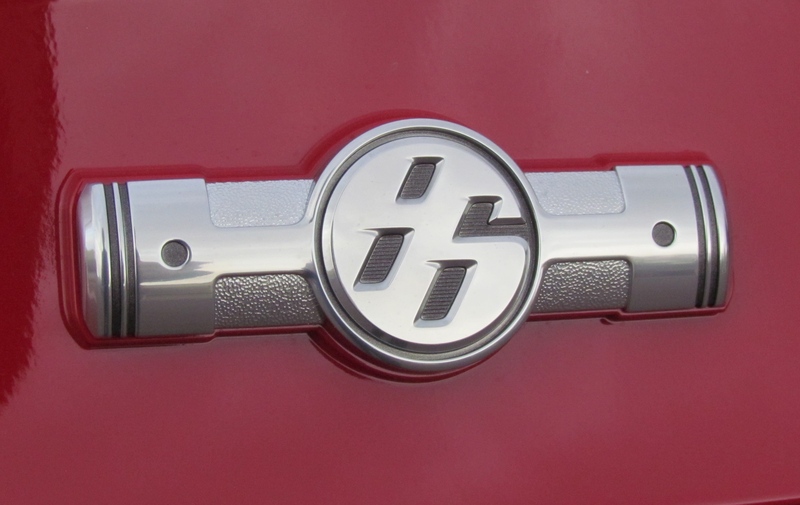 The nice folks at Toyota/Lexus/Scion offered a choice: I could spend a week doing a test drive of a 2015 Scion FR-S equipped with a manual transmission or an “Automatic with Paddle Shifters and Dynamic Rev Management.” While APSDRM has a certain ring to it, the choice was easy: 6-speed manual, please. So the car arrives, and it looks great with its Firestorm (brilliant shade of red) paint and its black (and red-trimmed) interior. And when you climb in behind the steering wheel, it feels as good as it looks, what with aluminum sport pedals and cloth seats that feel as if someone crossed ultra suede with neoprene, and then stuffed a nice pillow between your head and the seat-integrated headrest (for you other old-timers out there, we used to call them high-back buckets). Grab the leather-trimmed, tilt-and-telescoping steering wheel and your right hand drops (as it should) from the 3 o’clock position right atop the leather-wrapped shift knob. Wow, you think, this is going to be a great week. 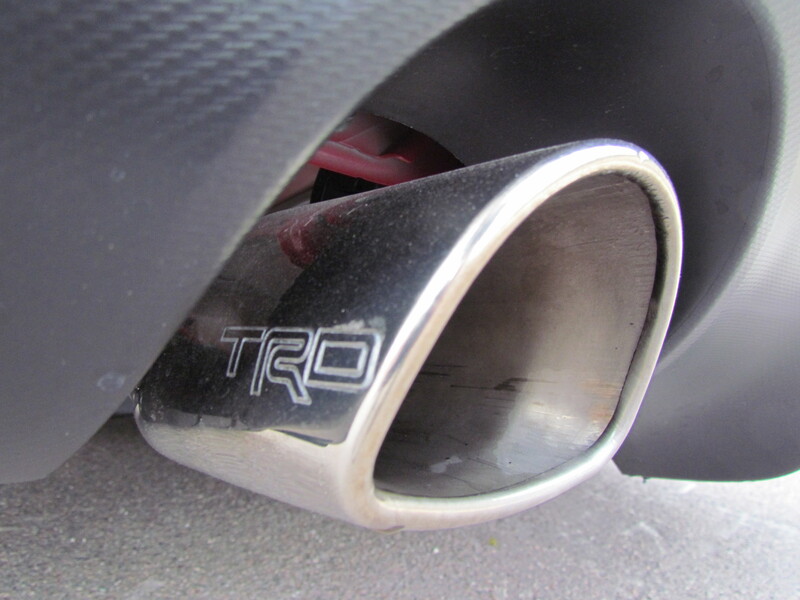 So you start the engine and notice the nice exhaust tone supplied by the cat-back exhaust system installed on this car by TRD, aka Toyota Racing Development. 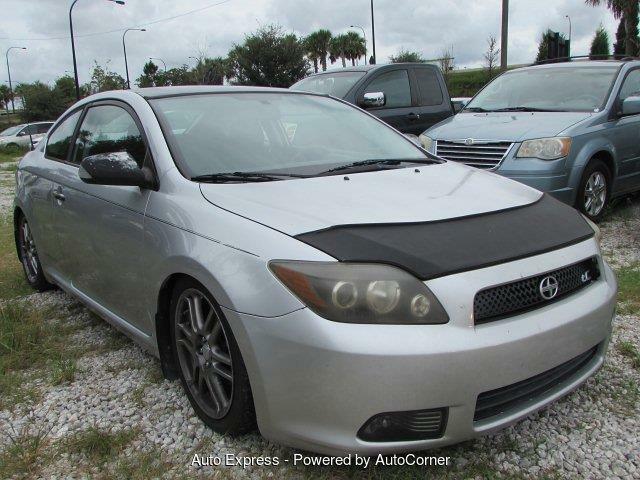 The Monroney pricing sheet also notes that this car has been equipped with a TRD (cold) air filter. Wow, you think, with a cold air intake and a less restrictive exhaust, this thing must really scoot. And then you start driving and wonder how miserable it must be to be stuck in the automatically shifted version of this car because you’re using the manual to wring every bit of power you can find in the 2.0-liter, horizontally opposed Subaru four-cylinder engine that lies between that TRD intake and that TRD exhaust. Figuring the cold-air system and less-restrictive exhaust system each might add as much as 5 horsepower to the engine’s output, you wonder how the stock 200-hp tuning must feel because this car feels, well, sluggish. So you do some exploring and finally discover that the engine really doesn’t even wake up until you have it spinning at more than 5,000 rpm. A check of the specs sheet shows the engine achieves its maximum horsepower at a screaming 7,000 rpm, and it also shows that the engine can produce only 151 pound-feet of torque and gets to that figure at 6,400 rpm. So not only is there not much torque, it doesn’t arrive nearly early enough. The result, if you’re a driving enthusiast, is having to work like crazy to make use of the power available, and at those rpm levels, you probably should forget about the 22 city/30 highway fuel economy figures you find on the Monroney. Those tests are done a normal engine loads, not those just a tick less than redline. and assembling the FR-S and its nearly identical cousin, the BRZ, in its plant in Japan’s Gunma Prefecture. 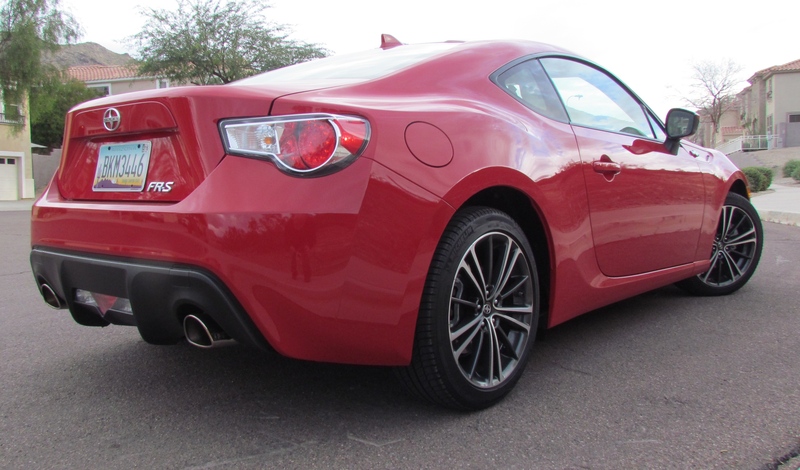 The FR-S is little changed from the 2014 version, though it does get a new shark-fin antenna and more rigid front suspension and new rear shock absorbers, both suspension modifications designed to enhance handling. Our test version also was equipped with a TRD rear anti-sway bar set to further enhance its dexterity when hustled around corners or pushed through curves. And the handling is nice. The little coupe has its engine in front and its driven wheels in the back. The electric power steering system is both responsive and provides nice feedback. There are disc brakes at each corner, 11.6 inches in diameter up front and 11.4 at the rear. 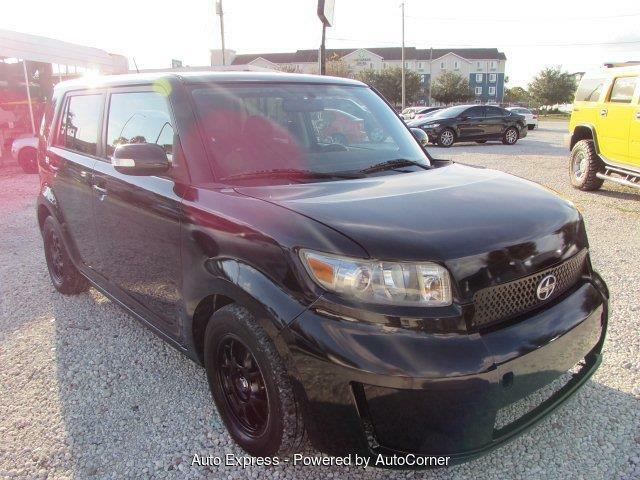 Between the OE changes and the TRD aftermarket bars, the thing is a hoot on cloverleaf-style freeway on ramps. Our test vehicle rode on Michelin Primacy HP summer tires, 215/45R17 in size and W-rated in for speed. W-rated tires are rated to168 mph and Tirerack.com notes that they are tires you’d put on an exotic sports car. 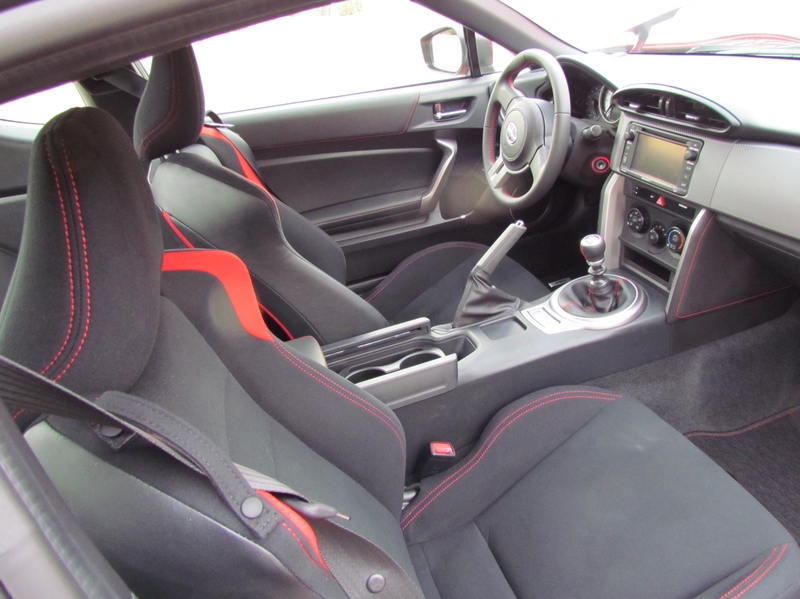 We add that this FR-S is not such a car. It is a nice, compact sports coupe that can be fun to drive if you’re willing to push up the revs. Still, we think it falls well short of even the V6-equipped Chevrolet Camaro or Ford Mustang, and both of them offer rockin’ V8s. 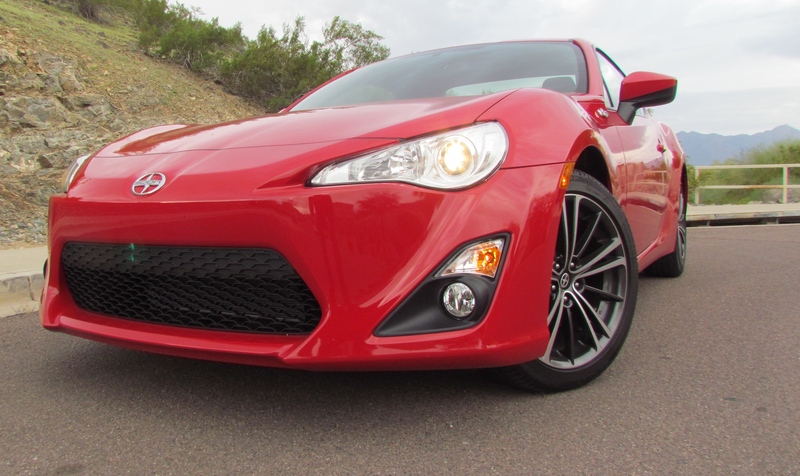 Base price on the 2015 Scion FR-S is $24,900 and includes keyless entry (including the trunk release), variable intermittent wipers, chrome-tipped dual exhaust, projector-beam halogen headlamps with automatic on/off LED taillamps. Inside, there is air conditioning, 6-way adjustable driver’s and 4-way front passenger seats (and rear seats we cannot imagine anyone ever actually sitting on), power locks and windows, aluminum pedals, digital and analog speedometer, leather-trimmed steering wheel and cruise control. The standard audio includes a 300-watt (160-watt head unit and 140-watt amplifier) Pioneer system with 6.1-inch touch sceen, HD radio and Bluetooth wireless phone technology. Toyota’s STAR safety system is standard, which means stability control, etc., as well as front, seat and curtain airbags. 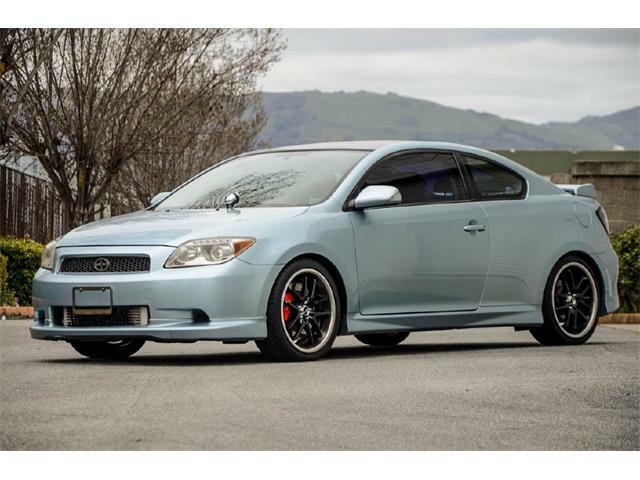 Our test car sticker for $29,336 and was equipped with those three TRD systems — $1,100 for the exhaust, $550 for the rear bars and $75 for the air filter — as well as optional fog lamps ($495), a center armrest ($249) and what the Monroney calls a “BeSpoke audio featuring Aha” ($1,199). But we’re drivers, not autophiles, though we did learn that BeSpoke audio includes voice navigation and access to 100,000 audio stations including seven Scion “signature” music channels. All we experienced really was that when the radio is turned off, that 6.1-inch touch screen displays “Audio off” letters across its face. And we’d have traded all that fancy Aha stuff for a rear-view camera display on that touch screen. Actually, what we’d really want is for Subaru or TRD to equip the Boxer engine with a turbocharger so it had some real punch. 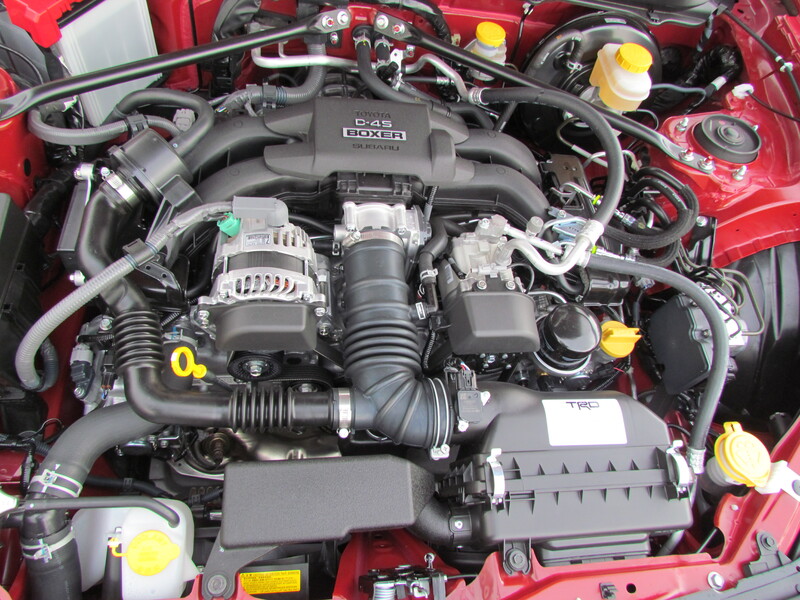 After all, there’s a 250-hp turbocharged version of the same 2.0-liter engine — and with 258 pound-feet of torque at just 2,000 rpm — available in the Subaru Forester 2.0XT.